The Nelson St Cycleway has been a fantastic addition to the city and phase two, from Victoria St to Market Place is currently under construction. 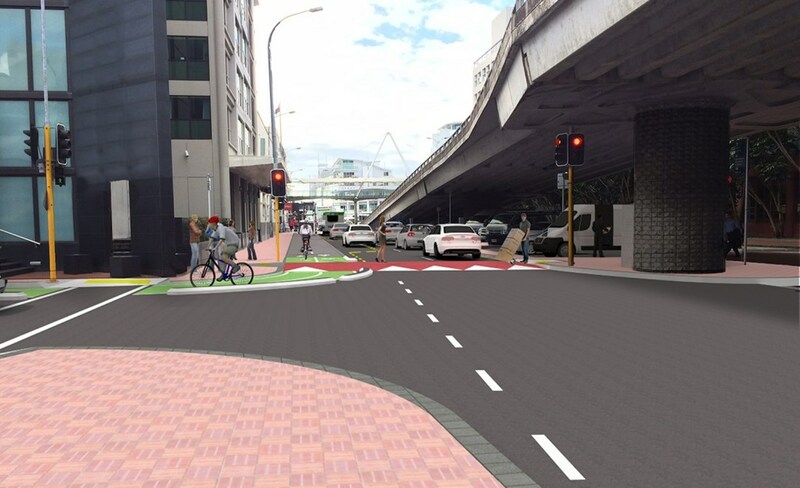 Auckland Transport are now consulting on the third and final stage which will see the cycleway extended to link in to the Quay St cycleway. The route will see the cycleway travel along the tree lined Market Place, before turning down Customs St west and then along Lower Hobson St. This is shown on the map below. 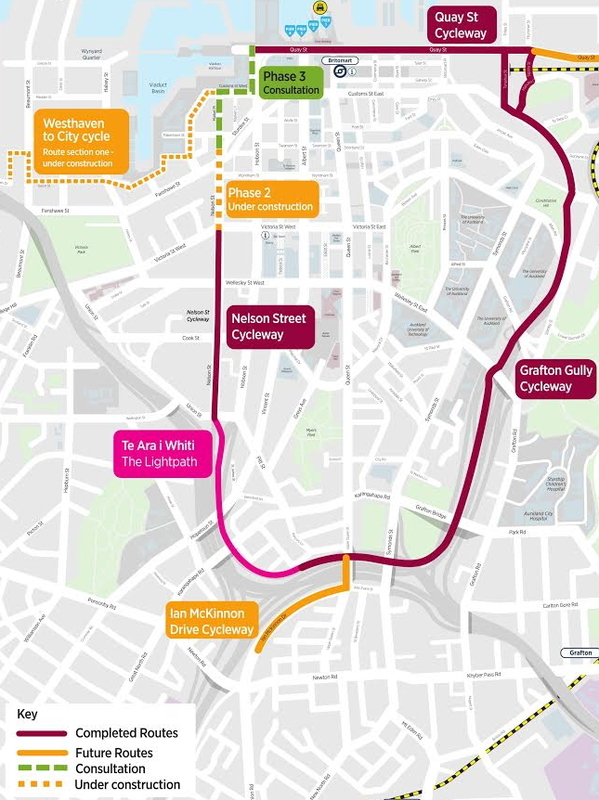 You may recall this route was the outcome of an earlier consultation in which AT had proposed sending the cycleway along Sturdee St and would have been a poor, and less attractive, outcome for users. To create space for the cycleway and retain parking, we would need to change Market Place to 1-way northbound traffic movement only. The cycleway would be located on the western side of the road at road level, separated from traffic by raised buffer islands and at driveway crossings by rubber speed humps. Angle parking on the western side of the road would be removed, and parking on the eastern side would change from parallel to angle parking. This rearrangement minimises the loss of parking on Market Place to only two spaces. Removing an entire direction of traffic must have caused consternation for some at AT but good on those involved for looking at the option. In addition to the cycleway, the new pedestrian infrastructure, like the crossings on the raised tables at each end of the street, will help improve walkability and be a welcome addition to the plans. We propose locating the cycleway on the northern side of the road and separating it from traffic by raising it level with the existing footpath. So deliveries are not impaired, we would ensure surfaces are flush by using painted and/or textured surfaces to delineate walking and cycling areas. A buffer zone in the first 1.2m of footpath would provide a landing area for deliveries. A 41m loading zone (which is greater than the current loading allocation) would be installed adjacent to the footpath. Delivery people and other users would need to cross the space allocated for cyclists, and care would need to be taken while everyone adjusts to the new arrangement. Some trees may need to be removed or relocated. Four car parks on the north side of the road would be removed, and the angle parking on the south side would change to parallel. Overall, the number of car parks would reduce by 16; however, this would be offset by large car parking buildings in the area. 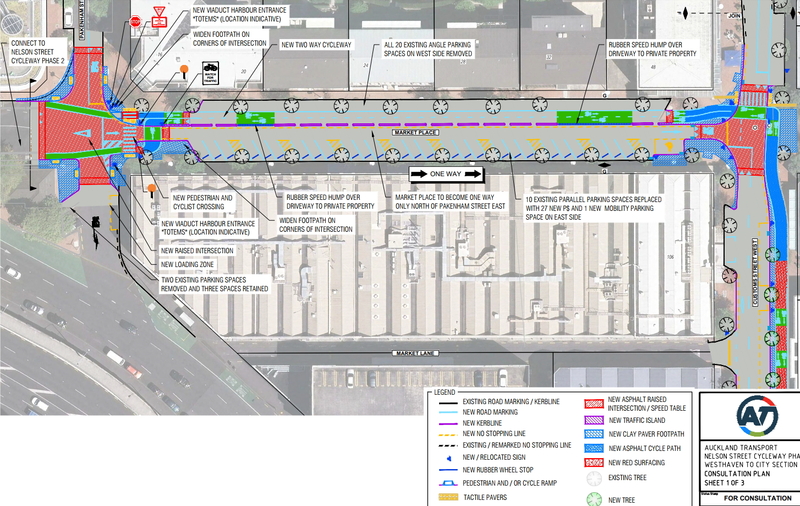 The thing that concerns me the most about this section is that the proposed layout (on AT’s site) shows the cycleway at just 2.8m wide which is fairly narrow. We propose locating the cycleway on the western side of the road and separating it from traffic by raising it level with the footpath. The tour coach parking would be moved to Customs Street West. The Explorer Bus would be relocated outside of the project area. The loading zone and taxi stand would shift to the outside edge of the cycleway, and operation would be restricted to between 7pm and 7am. This would mean that, during the day, we maintain 2 northbound traffic lanes. 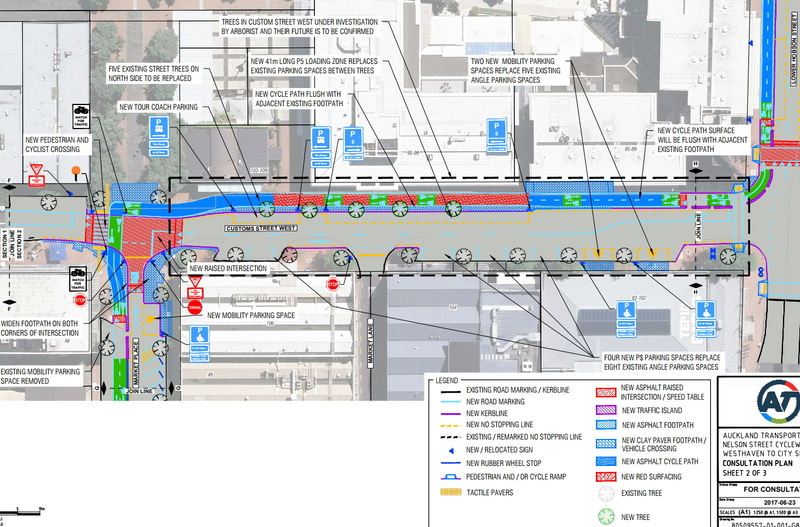 For daytime loading activities, we are proposing a number of options, including re-allocating 7 car parking spaces to 5 Loading Zone spaces under the adjacent flyover for smaller delivery vehicles and providing a 20.5m loading zone on the eastern side of Lower Hobson Street. The design plan shows 4 options, and we would like to hear from delivery people which arrangement would best support deliveries in the area. A raised crossing at the traffic lights where Customs Street West meets Lower Hobson Street would provide flush access between the new loading zones and the western side of Lower Hobson Street. Overall I think AT have done a decent job here. It’s a pretty tricky area of town to thread things through. Feedback is open till Sunday 1 October. I guess we’ll build up our own statistics about two way cycleways. I’ve read Finnish research that shows they are more dangerous. Personally, I hate cycling at night next to oncoming traffic because I can’t see anything with the headlights directed right into my eyes. I like the cycleway being raised to footpath level, but 2.8m is way too narrow for a two way cyclelane. Hope the trees can stay. Wonder why the arborist couldn’t ascertain whether they could stay before the documents were finished. Seems to be standard practice, and needs to change. Yes – I was knocked off my bike on the 2 way bike lane on Quay St as I was approaching the ferry terminal from the east. The driver exiting Queens Wharf habitually looked to his right to check for cars on his side of the road – and – crash, he rolled into me. Luckily I read the situation, braked hard and bailed off unhurt. But buckled front wheel and other more minor damage to the bike. This seems like a really good way to maintain essential access and allow safe cycling journeys. I think we are too worried about the width; this is a narrow road with competing demands and cyclists should be going slow. Yes think they done a pretty good job from what I can see, do you know how wide is the bi-directional existing Nelson St Cycleway for reference? Great thanks, thought it would be. Very good, only one thing to add; I do think more loading zone spaces down here are important, more important than passenger vehicle parking. They are proposing a two-legged hop to cross Quay Street, which seems unnecessary – is it not already a Barnes dance? Yes, that’s what everyone will do, so it should be permitted with road markings (or removal of all directional crossing markings) to avoid confusion and conflict. The two crossing are basically already there and it’s a barnes dance so everyone just crosses diagonally as it is. Good plan – just wish it was all happening faster. 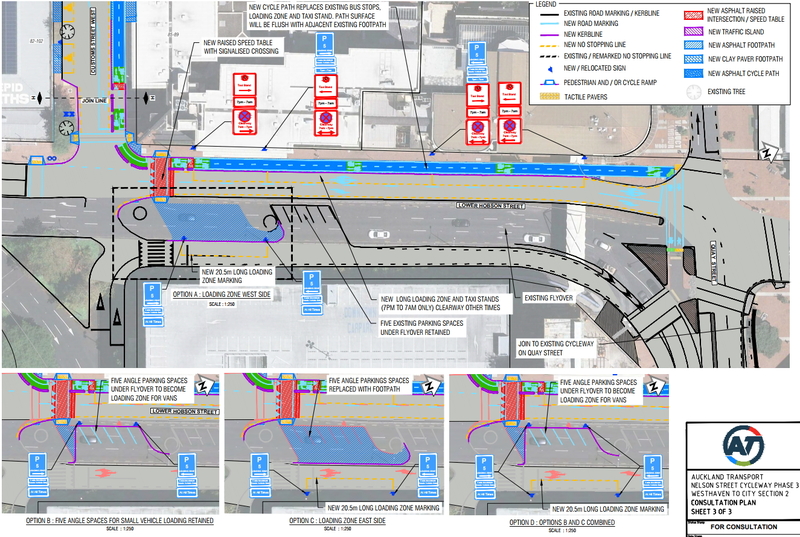 As an aside, AT’s website was confusing, as seems to have labeled Phase 2 heading wrong (“Phase 2: Nelson Street to Quay Street and Beresford Square to Hobson Street”) & doesn’t have nice design PDF maps of this phase (ie the one already under construction) – just has the blurry ones buried in the feedback report. Sure is a confusing intersection area there. Originally, Phase 1 was Lightpath and Nelson Street as far as Victoria and Phase 2 was K Road to Nelson Street (via Pitt Street) and Victoria Street to Quay Street. Their website is a bit of a mess of this old phasing and the new phasing. It’s pretty disappointing that, in the second image, AT haven’t included the Victoria Street, Franklin Road, K Road, or Great North Road cycleways which are coming up, or the rest of the completed Beach Road cycleway. Having made Market Place one way what happens to the southbound traffic? Probably take Market Place to Pakenham Street East to Customs Street West to Viaduct Harbour Avenue to Halsey Street to Fanshawe Street. Either that, or just go East on Customs Street West. Is quite right? Market Pl will be one way north not south. But only after Pakenham St E ie, towards the North Shore direction. Ahhh maybe you mean if you start on the southern end of Market Pl, but in that case you can just go south. Yes, it depends where on Market Place you’re starting from. If you’re south of Pakenham Street East, you’ll still be able to turn right into Fanshawe to get on SH1 at Beaumont Street. I guess that part of the intersection is part of the current works so that’s why it’s in phase 2. I wonder if angle parking should be backed into in these areas as a start to a universal change for NZ. Australian experience makes it a far more preferable way of dealing with angle parking. Can someone intelligent (that rules out a lot of you) tell me why AT is doing separate consultation for stage 3 of a project? Not only is this cost inefficient it’s mind numbingly stupid. These cycle paths form a network so stage 3 affects stages 1&2 and vice versa. If there was a potential issue with stage 3 this should be dealt with prior to stage 1 being built. The only reason you would do this is to subvert democracy by building the first two stages. By doing so any issues with stage 3 become insignificant relative to completing the network rather than being dealt with in a civilised and professional manner. So you want people to treat you “in a civilised and professional manner.” and you then write “Can someone intelligent (that rules out a lot of you).” Hypocrisy seems to be your main trait – either that or a complete lack of self insight. And by the way, of course someone “can” tell you but whether they “would” or not is another matter entirely. He would have opposed it either way. So nothing to see here but his ideology and, as you say, lack of real insight into the issue at all. Stage three wasn’t confirmed when Stage 1 and 2 were planned. It had a couple of options that were dependent on other projects and on consultation with residents and stakeholders. At one point they were looking at not doing it at all and moving on to other cyleways instead. They thought the residents on Market Place would be against using that road for a cycleway, but turns out they weren’t once they had some exposure to the design and input. Rather than subverting democracy they were not being autocratic by forcing a predetermined solution. You’re do it all at once or never do anything approach is, frankly, foolish. Thats simply not an effective way to develop a living, breathing, growing city, and certainly how things can get done in practice. That’s right, they are trying to subvert democracy. And bamboozle opinionated buffoons. Unfortunately I drive southbound on Market Place every day to get out of the city from Quay St without getting stuck on the overpass. When the overpass also goes, I guess I’ll have to find a way to Customs St but that doesn’t seem like it’ll be particularly easy (considering it already isn’t). Ideally, I wouldn’t leave the city by driving across it anyway… but the SH16 port to SH1 connection is barely functional. Motorways should connect to motorways without metering, otherwise city streets do get “misused”. So quite a positive outcome for the area then isn’t it, I’m sure there are many others like yourself that rat-run through the area to avoid ‘traffic’ in reality simply spreading the traffic you are yourself a part of, making it more unpleasant for those living, working, walking, driving, biking, dining here. Now that this option is gone for you, the area can be enjoyed, rather than have cars driving through it on the way to a freeway. Hey… like I said, I wish it wasn’t the best way to avoid burning fuel in traffic, but it is. I’m hoping that as Market Pl can be made into a better Market Pl, so the SH16 to SH1 North connection can be made better too… then people like me can get from the eastern CBD to the north without driving across the CBD at all. (BTW… I take slight offence at it being called “rat running” when this site also clearly hates the overpass… I’m avoiding using it to help prove it need not be there). Actually, if you are Eastern CBD you can get on at Stanley Street and Go North through the CMJ. The Grafton Gully motorway was built for the promised purpose that it would remove rat-running through the city such as from East to North Shore. What else is it you want? An elevated freeway along Quay Street as was also originally proposed. No offence intended and not sure why you are taking offence at me saying you’re rat running. Taking this short cut as well as driving across the central city rather than using the motorway is the definition of rat running. I want the motorways to actually connect without a traffic light so it’s not faster to use city streets. I live here, next to the Market Place, and this sort of rat running manefests itself in high speed encounters between cars and people – with us trying to cross the road, bicycle or navigate pushing a pram. It’s not ok.
Why don’t they close the short section of Pakenham Street East between Market Pl and Sturdee St. There were plans to turn the public toilets into a cafe. A new “Pakenham Plaza” could be great here.